We can relate to Gene Belcher. Sure, we never had a talking toilet that could tell jokes as a best friend and maybe we never had what it takes to enter into the field of competitive table setting, but we DO know what it's like to crave attention. 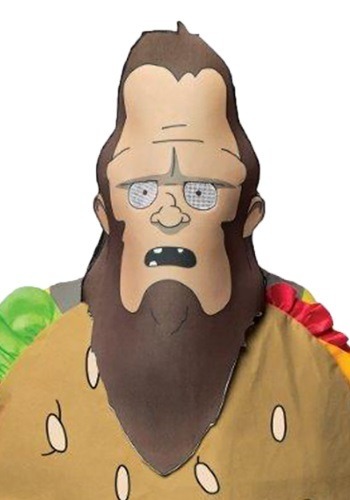 The kind of attention that you can only get by transforming into the savage Beefsquatch, who's only desire is to eat hamburgers while ruining Bob's cooking show. If you want that kind of transformation, then you're going to need this licensed Bob's Burgers mask! Based on the one worn by Gene in season 2 finale, this Bob's Burgers Beefsquatch mask recreates the look perfectly! The front of the mask has the signature disgruntled stare of the beast in front, along with a gaping mouth. Mesh in the eyes allow for vision, while you rampage on the next cooking segment of the local news, or while you quote some of Gene's most hilarious sayings with your friends.